A typical antifreeze/coolant formulation is 96% water and glycol. It efficiently transfers heat out of a hot engine and prevents freeze-ups in a cold one. But that last 4% is important and can have a lasting impact on your engine. In heavy-duty diesel engine applications, antifreeze/coolants are formulated to prevent cavitation and liner pitting in wet sleeve liners. 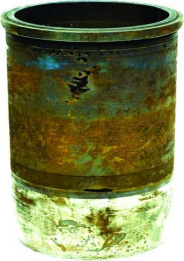 A wet sleeve cylinder liner is a replaceable metal sleeve inserted into a diesel engine block to improve heat transfer and enhance serviceability of heavy-duty engines. It is also considered one of the most common and costly cooling system repairs. occurring as the piston moves up and down. High pressures generated in very small areas cause the collapsing bubbles to hammer the liner and effectively drill small holes into the liner wall. If allowed to progress, the holes eventually penetrate through the liner wall and allow oil and coolants to mix. Coolant additives, referred to as inhibitors, prevent this catastrophic occurrence. They form a hard surface on the liner wall that shields the metal from the effects of the vapor bubble implosion and subsequent pitting. There are two general categories of inhibitors: inorganic and organic. Conventional fluids are typically comprised of inorganic metals that create a strong plating film on the liner surface. They act fast and cover all components throughout the cooling system equally. Unfortunately, they also deplete quickly and result in short-lived protection unless supplemental coolant additives (SCAs) are added periodically. Organic acid technology (OAT) inhibitors are preferred by the majority of today’s OEMs and eliminate the need to add SCAs or hassle with SCA maintenance. Instead of covering the entire system equally, OAT inhibitors move to trouble spots as needed and selectively protect the cooling system. They last much longer than inorganic inhibitors and can be used up to a million miles, 20,000 hours, or eight years. Another similar technology, nitrite organic acid technology (NOAT), contains an organic inhibitor plus nitrite and offers additional wet sleeve liner protection. Selecting the right antifreeze for your application can be confusing. Contact your local FS energy specialist to determine if OAT, NOAT, conventional, or prediluted coolants best meet your needs.